I’m linking up with Jen over at Teacher By the Beach for her Monday Motivation series. This week is all about Word Walls. 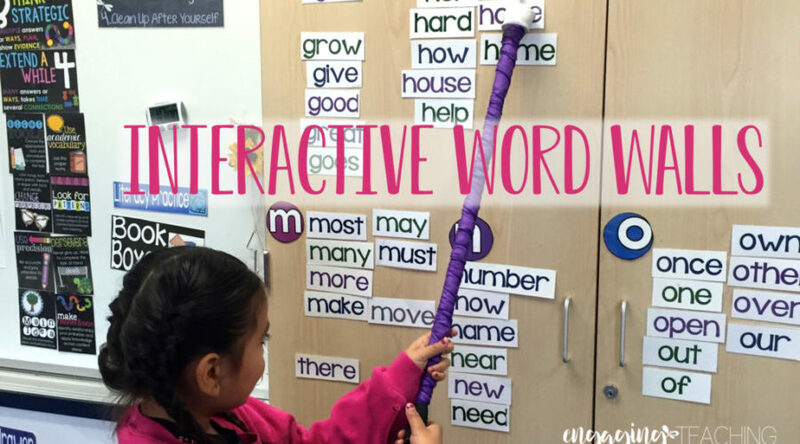 I love this idea because there are a TON of ways to address the Word Wall situation and I think I’ve tried them all! My word wall is on my closet doors. But those words don’t actually BEGIN at the closet doors. The word wall routine I’ve enjoyed for the longest time is directly tied to our homework and sight word focus each week. Let me begin by saying I’m not a big homework fan and I handle homework different from most. I’ll go into that in a later post. HOWEVER, I do assign the kids 9 sight words each week. I do not insist that they know how to spell all 9. Just read them. So that’s where the word wall comes in. Each week 9 new sight words go up on our focus wall. We work with these words every day of the week. At the end of the week, I move these words to the word wall. This is a tiny part of my focus wall. Our “spelling words” for the week are phonics driven. We learn 9 new sight/high-frequency words each week. These words are part of the |Homework Time – Wonders| resource. Each day, we review the word wall. The entire word wall. This gives fluency practice to the kids who are close to mastery. Identification practice to those not quite there yet. And a, “let me teach you because I totally KNOW these!” boost to those who have mastered them. There are only 3 jobs in my classroom. Each one job has a few duties. The “Messenger” is like my assistant. He/She runs the morning review time. Part of that is to point at the sight words (as quickly as possible) as the rest of the kiddos read the words. Then, after the class has read the words, she selects one name stick from a cup I have in the cupboard beside the word wall doors. That person then comes up to read those words on their own, as quickly as the “messenger” can point to them. If they run into a word they aren’t sure of, the rest of the students help them out. If they can read all of the words without messing up on more than 2 of them, their stick moves into the PASSED cup. THIS is super helpful for me! I do not have to waste time doing 1:1 sight word assessments with my kiddos. I know exactly how they are doing based on their stick placement. Those few who need the extra help have sticks that never quite make it to the “passed” cup, so I work with them either 1:1 or in small groups. Assessment (both formative and summative) done! I have a lot of words to store. I keep them grouped alphabetically and by trimester in little plastic “coupon holders”. These are great because they have a little drawer that slides in and out and a tab to keep the container closed. They are the perfect size to keep an entire trimester’s worth of cards. I found these at the Dollar Spot in Target a few years ago. With 9 words a week, EVERY week – the word wall gets filled quite quickly. Every few weeks I conduct a “just for the teacher spelling test”. I grab about 20 words off the wall that I believe the kids have mastered and even know how to spell. I give the kids some lined newsprint paper that I fold into thirds beforehand. After demonstrating how to draw lines to divide the columns and write numbers on each line, I give the kids the spelling test. I look over their papers. As long as no more than 2 of my students spell a word incorrectly, I keep it off the word wall to make room for new words. If more than a couple of kids struggled with the word, I keep it up there. I do not record these “tests” for any kind of grade. The word wall is large and colorful. The kids use it all the time. If they ask how to spell a word, their table mates or I can just say “its one of the blue words under I”. Another awesome part about it, many of my word work centers work around the word wall! They literally utilize it all day. One of their absolute favorite thing to do during “Your Time” (free choice time = their time) is to play teacher and point at the words while their friend(s) read them. So that’s it. I’ve had word walls that we didn’t interact with daily. Those were a waste of time and space. I’ve had a good stretch of time with absolutely no word wall. But found that my kids weren’t mastering their sight words all that well and asking me how to spell things too often. This routine has solved a lot of issues. They recognize and are fluent in a lot more words at a quicker learning pace, sight word mastery assessment has become a breeze, and they have yet another area of the classroom that is really THEIRS. In addition to the word wall, the kids also use the mini-word wall that is included in their My Journal. As one of the activities during word work, they can color/highlight the words in their journal the same color as the words on the wall. Just another way to engage in high frequency words! My journal is in the Follower Freebie file. It was also sent out in an email link. If you aren’t a follower yet, just click on one of the links the image below to grab this FREEBIE! Don’t forget to head on over and visit my lovely friend Jen for some more Word Wall Motivation! I’d love to hear your word wall thoughts! What kinds of activities do you do with yours? It would be SO awesome to be teaching neighbors!!!! California and Florida are just TOO far away from each other! What a great post! It’s so true that if you just post the words and do nothing with them, it is really pointless to even have a word wall. Thanks for sharing!